The Last Supper scene from Rev. Smith’s The Brick Testament website was very briefly featured on last night’s edition of Comedy Central’s The Daily Show with Jon Stewart. As part of a recurring segment entitled This Week in God, correspondent Rob Corddry utilizes the “God machine” to very quickly cycle through a host of random religious images before slowing down to stop on an image related to the topic to be discussed. 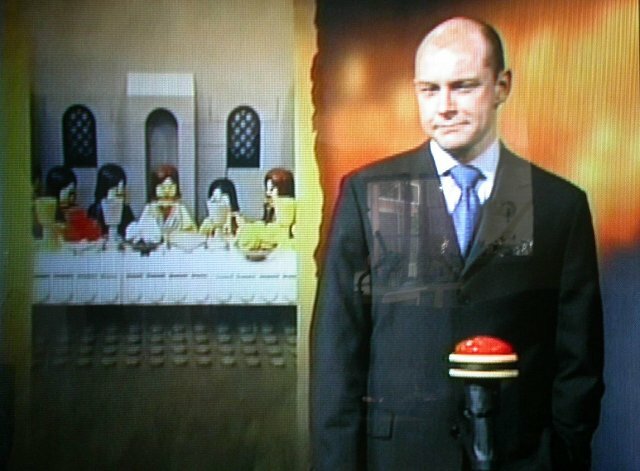 Smith’s LEGO rendition of The Last Supper appeared during the slowing-down part, which means that the Brick Testament image was on screen for approximately one and a half seconds. Actor Bill Pullman has been allowed to return to the film world this week, after serving eight years of a 10-year ban-from-all-movies following his appearance in the summer blockbuster Independence Day. The Movie Board of America agreed to release Pullman early based on the fact that the actor shown “deep regret” for appearing in the 1996 film. Pullman was not the only actor to face disciplinary action for their roles in that film. Actors Jeff Goldblum and Judd Hirsch each received a five-year ban on movies with budgets over $100 million, and Randy Quaid was barred from ever acting again in any capacity. The latest issue of Time magazine features an exclusive report on what’s hot and what’s not for Summer ‘04, and it’s no surprise that Middle East Decapitations have everyone talking. They’re all the rage as we head into the hot summer months, and their popularity has prompted more than one reporter to dub them “this year’s school shootings”. Said one middle school social outcast in the article , “If I were going to shoot people at school, I wouldn’t just shoot them, I’d behead some of them, and videotape it, and put it on the internet.” Look for celebrity decapitations to heat up the news in July and August, and new beheading-based reality-TV programs to be ready for network prime-time this Fall.